The new and improved version of the popular monthly disposable originally called Purevision 2HD combines pioneering optical technology with excellent breathability and hydration. 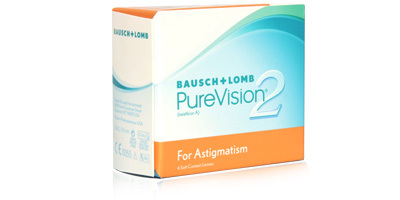 Purevision 2 for Astigmatism are custom engineered to correct astigmatism and combat the effects of the glare of the sun, halos, and blurred vision. 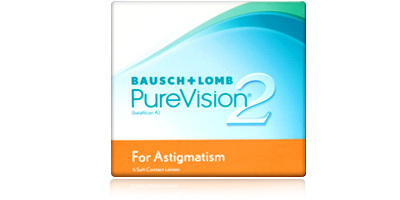 Bausch & Lomb Purevision 2 for Astigmatism contact lenses feature innovative Auto Align Design, which delivers outstanding stabilisation and clarity from moment of application until removal. They�re ideal for those who sit in front of computer screens for long stretches and need a soft, high performance lens designed to handle the various demands of busy modern life. They supply outstanding sharp focus and clear vision in all light conditions, and work particularly well in low and dim light. Whether you�re driving in direct sunlight or working on the PC at night, these monthly disposable lenses will supply constant crisp vision. Bausch &Lomb�s exclusive Comfort Moist technology supports eye healthy by way of a breathable silicone hydrogel material called Balafilcon A, which allows exceptionally high levels of oxygen to pass through the lens to the eye. Purevision 2 toric lenses are packaged in a moisture-rich solution that keeps eyes naturally hydrated, bright and comfortable for over 12 hours of continuous wear. 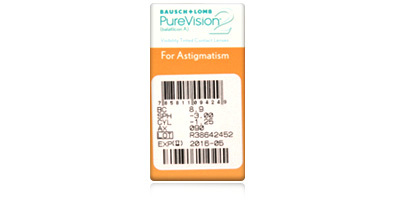 One of the thinnest lenses available at the moment, Purevision 2 for Astigmatism are nevertheless simple to handle and apply. A slight blue tint makes them visible in and out of solution. Call 0800 037 4000 with any questions regarding Contact Lenses Express or the products on our site. A range of delivery options are available, including express delivery. The vast majority of the contact lenses featured on this site can be shipped on the day you place an order.